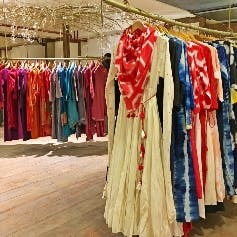 Mora Taara In Gurgaon Has The Best Indo-Western Designer Wear At Prices That Won't Break The Bank! For once I must say that this place is gorgeous! But coming back to the moot point of clothing - we love the fact that Mora Taara in Gurgaon boasts a whole range of Indian designers - Sasa, Shivani Bhargava, Ekum, K-clothing and much more. We are personally partial to Ruwaa and cant help being just a bit smug when we get compliments on a wonderful summery dress we snagged from here for under INR 5000. And at prices within INR 2000 to 9000, you are talking about affordable high-quality outfits with a clean and unique design sensibility. What's not to love! If you are petite and generally lean towards the XS section of the rack, you may not find everything in your size. But the good news is that they can often work with the designer to get a design replicated in your size. Just ask. Don't just update your wardrobe with a visit to Mora Taara. Your home will thank you too - for their home decor collection is quite something. We love the gorgeous wall plates, mugs with parrot motifs and adorable cookie tins. Mora Taara's store is a haven of tranquillity and beauty that's really hard to leave, without at least one pretty thing to take back with you!